For its entire existence, the legal business has been focused locally. And most legal marketing has been highly personal, often conducted over dinner and drinks. We have entered a world where it is commonplace for attorney and client to work in different time zones. And as attorneys increasingly compete for business in a wider marketplace, there will be a fundamental shift in how law firms operate — and develop business. What is forcing this change? First, the internet made it cheap to communicate over long distances. Then web technologies like Skype and WebEx came along and made it easy. However, these technological advances are just part of the story. Something bigger has occurred: our culture has changed. 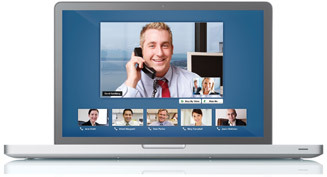 Online collaboration tools like WebEx and Skype have made it easy and inexpensive to serve clients who are located far away. My company has team members on three continents. This is not a problem because they all speak English flawlessly — and thanks to Skype and other online collaboration tools, communication is practically seamless. My company recently built a website for an international conglomerate headquartered less than 50 miles from our offices. The client did not have a need to meet us in person — during the pitch or the project’s execution. All meetings were conducted via WebEx and included participants from England, France and New Jersey. My company was recently looking to hire an IP attorney. The attorney that had the greatest amount of relevant expertise was located on the opposite coast — in Seattle. Their location did not matter to us. Geography was simply not a factor. The four items listed above are just the tip of the iceberg. I could go on for pages. Now, I realize that my firm might be a bit ahead of the curve. However, based on what I see among my contemporaries, I don’t think we’re on the bleeding edge. As my generation (I’m 39 years old) moves into positions of influence in larger organizations, I believe that long-distance relationships will become the norm. How does this shift affect legal marketing? As geographic barriers are brought down, clients will be able to select attorneys from a much larger pool. This fundamentally changes the competitive landscape for legal services. And it will force every aspiring rainmaker to ponder the question: if a client can choose any attorney in the world, why should they choose you? A focus on individual attorneys: Firms will focus more effort and resources on promoting the highly specialized expertise of individual attorneys and practice areas. Likewise, there will be less emphasis on broad, firm-wide marketing and branding. More thought leadership: Clients looking for an authority in a particular area will expect you to prove your expertise. As a result, expect a large increase in volume of attorney-generated content — such as articles, blogs, videos and podcasts — that enable attorneys to illustrate their specialized skills. Emphasis on website bios: Prospective clients will increasingly be turning to the web for information about attorneys — and many studies show that they’ll be heading straight to attorney bios. 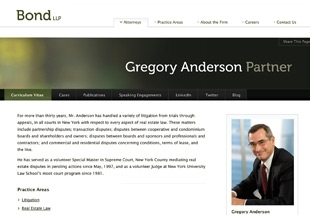 As a result, you can expect attorney bios to become much more comprehensive. They will grow from being a simple resume to being an elaborate repository of information that positions an attorney to win the most lucrative work. More personal information: As face-to-face meetings become less essential (and thus less common), attorneys in the “Facebook generation” will use their website bios as a platform to create an emotional connection with prospective clients. Expect to see more-engaging attorney portraits and increased use of video as well as lots more personal information about attorneys. Will these changes happen overnight? No, although many firms have begun to adjust their business development methods to the needs of long-distance clients. But what we’re seeing now is just the beginning. I predict that five years from now — after the market further widens — the legal industry will look very different. As is the case with any industry shake-up, there will likely be big winners and big losers. And the most nimble firms — the ones that have best adapted to the needs of long-distance clients — will be the ones winning the lion’s share of the most lucrative work.